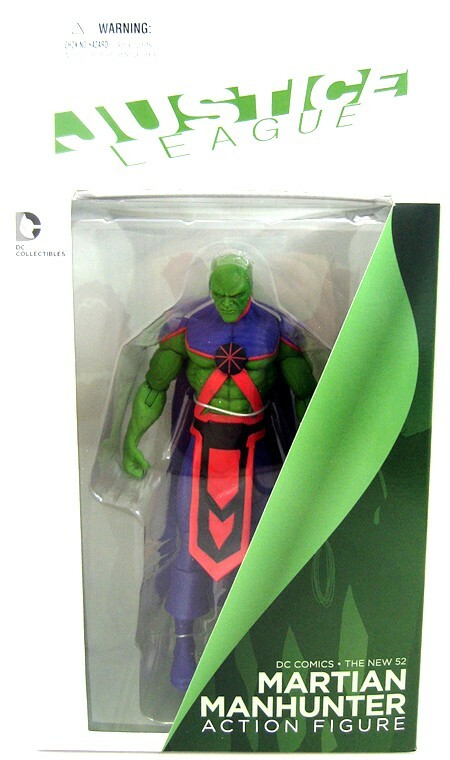 This action figure features Martian Manhunter who is a stranger to Earth, but not to justice. Straight from the pages of DC Comics – The New 52 comes the newest member of the Justice League of America! Standing approximately 7 inches tall, be sure to get your hands on this action figure before it’s too late. DC Universe: SERIES 15 ARRIVES! DC UNIVERSE SERIES 15 has now arrived an is in-stock and ready to be ordered! The smoothly-sculpted and brilliantly-designed 7-inch figures look as great as their predecessors and add some highly-sought-after characters to the DC Universe line-up. Available individually or in complete sets (with your choice of character variants), look for the following heroes and villains heading your way–with Build-a-Figure parts, of course! STARRO THE CONQUEROR is the main attraction in this brand new figure set featuring the super-villain facing off against Wonder Woman, Green Lantern, Aquaman, the Flash and Martian Manhunter. It’s a San Diego Comic Con exclusive from this year’s show and has just arrived on our shelves! If you’re a fan of the classic covers, then this is definitely one for you: it brilliantly recreates The Brave and the Bold Issue #28 and the epic battle waged on the front page. But best of all–and I mean this–is the packaging. Normally, I’m all about the contents, but this is probably the coolest box I’ve ever encountered on any toy or collectible. Why? Because it talks. Seriously. With the voice of Kevin Conroy (Batman in Batman the Animated Series, Gotham Knight, JLA, the Arkham Asylum video game, etc. ), the box narrates exactly what’s going down on the cover/in the showcase. Really. In fact, here’s a review of the figure that gives you a look at just how awesome that is. Each of the little figures stands about 3.75 inches tall, making them proportional to DC’s Infinite Heroes collection. Starro himself stands about twice that high and is wired rubber for some excellent bending action worthy of the intergalactic starfish he is. To snag him or any of the other awesome toys from 2010’s show, check out our San Diego Comic Con Exclusives section over at CmdStore! Just click the pic below! Green Lantern: Blackest Night figure pre-orders! Green Lantern fan? Then you’re probably looking forward to the upcoming “Blackest Night” event (info at the wiki), drawing all four of DC’s main Green Lanterns (Hal Jordan, Guy Gardner, John Stewart and Kyle Rayner) into an epic battle not only for the world, but for the universe. It all begins July 15th and DC Direct will start rolling out the merch in October, including Boodikka, Black Lantern Earth-2 Superman, Blue Lantern Saint Walker and Red Lantern Atrocitus. The second series will hit shelves in November, featuring Indigo Lantern, Yellow Lantern Kryb, Black Lantern Martian Manhunter and Green Lantern John Stewart. You can already pre-order those items, but if you’re looking for something here and now, check out the rest of our Green Lantern Collection!